A stylish Wave Original -relaxation lounger is suitable for a sand beach too, because of its separate legs. The design of Wave Solid -relaxation lounger is entirely smooth and sinuous. The adjustable chair-back of the classical lounger is made of solid birch wood and ensures a comfortable sitting position. Take it easy on the relaxation lounger. The seat of the relaxation lounger is made of form pressed laminated veneer lumber – birch. 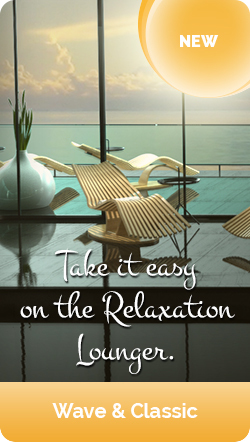 The sinuous design of the relaxation lounger ensures a comfortable and ergonomic sitting position. Thanks to the different possibilities of surface coating, the relaxation loungers are suitable for being used at outdoor-, interior- as well as pool areas. Wave -relaxation loungers are available in four different models as well as a more traditional Classic -relaxation lounger.